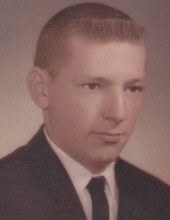 Moosup-Thomas R. Frink, 71 passed away unexpectedly March 13, 2019. He was born January 29, 1948 to the late Lloyd and Doris Frink. Mr. Frink retired from Electric Boat after 40 years. He was a member of Masonic Lodge No 113, A.F. & A.M. Mr. Frink was a former treasurer of the Sterling Volunteer Fire Co. He was predeceased by his wife Kathleen. He is survived by a brother Lloyd, a sister Janet and nieces and nephews. Calling hours will be held on Tuesday March 19, 2019 from 6:00-8:00PM in Tillinghast Funeral Home 433 Main Street Danielson. Burial will be private. In lieu of flowers memorial gifts may be made to the Plainfield VFW, 7 Windsor Ave. Plainfield, CT Tom had many friends there. To send flowers or a remembrance gift to the family of Thomas R. Frink, please visit our Tribute Store. "Email Address" would like to share the life celebration of Thomas R. Frink. Click on the "link" to go to share a favorite memory or leave a condolence message for the family.